So every now and then my official day job and my passion for music cross paths. This a rarity but this past weekend it occured. And where else but Sunny Las Vegas, Nevada. For the record, I can’t stand Vegas. 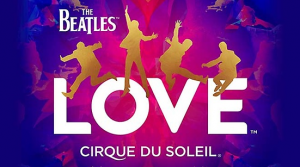 But when they’re producing shows like Cirque Du Soleil’s “Love” then I’ll make an exception and look forward to going. If you haven’t heard the entire album yet and you’re a die hard Beatles fan, what the heck you wanting for – purchase right now. If you’re not a die hard fan, you may appreciate a little background on the album. And why did they make this album? Was it to make another comp of Beatles songs to fit in with the 100 or so other compilations? No. They did this because Cirque’s Du Soleil asked them to. And if you need me to tell you who they are, you probably shouldn’t keep reading this post or this blog for that matter. Since the songs don’t change all too much to the untrained ear, it may not make sense to those fare weather Beatles fans to buy the album. But you must keep in mind that the intentions of the album were not to be played by itself – this is for the Cirque Du Soleil accompanying the changes, the enhanced guitar riffs and the interwoven tracks. This takes the Love album concept in to a whole new dimension. The show follows the album right from the opening track “Because” to “All You Need Is Love.” The performers wear 60’s style garb, as you would expect. Some featured similar Big Band cosutmes as the Fab Four wore on the cover of Sgt. Peppers. Some wear peace symbols and tie dye shirts. There were English armed forces and police officers during “Revolution.” There were strings of lights that reached from the ceiling to just about eye level that came dangling down during “Lucy in the Sky With Diamonds” and the lights blinked on and off to the beat. The latter was one of the highlights for me. Another highlight was the “Something – Blue Jay Way (Transition)” scene. In this scene a professional male ballet dancer stood in the middle of the stage (All Cirque stages are circular with the audience wrapped around) while four young flying females in loose white cloth swang back and forth gracefully in to the middle of the stage near him. As if to tease him, they all swang back and forth. His arms stretched out every time they came near and when he got close they would swing back away as he awaited another flying temptress. When the song comes in with, “Something in the way she moves…”, combined with the swinging motion and graceful ballet performance the scene was quite impressive. The theatre has 12,000 speakers. Every seat has 6 speakers in them so you can just imagine with the combined visual effects and audio effects, this was one overwhelming performance. In conclusion, I say that if you’re a die hard fan, both the album and the show are a must. If you’re just a fan, the album is not necessary but still worth it and the show is a must. And if you’re just a fare weather guy or gal, the album isn’t worth it but the show is a must. In any case, if you’re in Vegas, this is well worth your money.